I’m not a big football fan, I’ll be honest. But I get really hyped up when it comes to the Super Bowl. I mean, who doesn’t love to cheer, throw a party and drink beer all day? 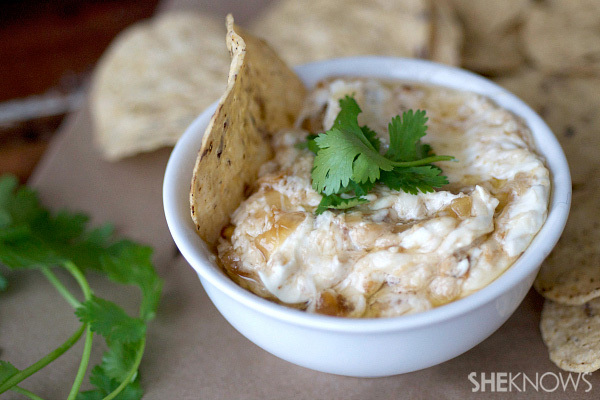 I’m stoked to throw my own party this year, complete with these amazing slow cooker snacks. We are finally in a place to start entertaining, and there’s no better event to start with than the Super Bowl. 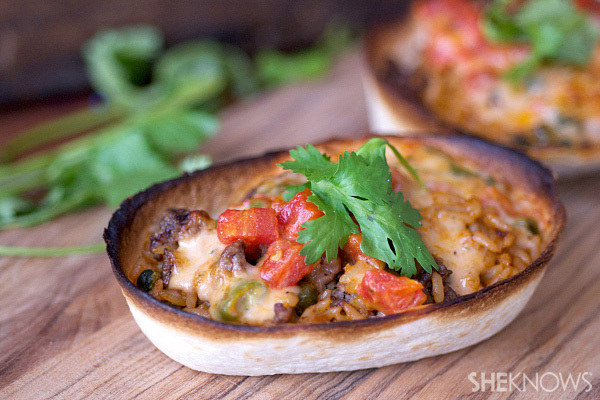 Meatball sliders, ground beef Spanish rice bowls and cheesy onion dip should make my party the best on the block. If not, I have a fully stocked bar, so that helps. To make the rolls, mix the yeast, water, sugar and salt in a large bowl of a stand mixer. Let sit for about 10 minutes or until foamy. Fit the mixer with a dough attachment and add 1-1/2 tablespoons of unsalted butter and 1 cup of flour. Mix on low and add the remaining flour, 1/2 cup at a time. Knead on low for about 4-6 minutes, or until smooth and elastic. Move the dough to a floured surface and flour your hands. Knead the dough another 4 minutes or until elastic and soft. Place the dough in a greased bowl and cover with greased plastic wrap. Let rise an hour in a warm place or until doubled in size. Place the ball on a hard surface. Using a serrated knife, cut the dough in half vertically, then each half vertically again into thirds so you have 3 equal strips of dough. Cut each strip of dough into fourths by cutting horizontally to make 12 squares. Roll the squares slightly into a soft ball. Place each rolled piece of dough into a lightly greased 9 x 13-inch baking pan. Cover with plastic wrap and let rise another 30 minutes. Melt the remaining 1-1/2 tablespoons of butter. Lightly brush the rolls with about half of the melted butter before baking. Preheat oven to 350 degrees F. Bake the rolls until golden brown, for about 16 minutes. Brush with remaining butter. For the meatballs, place all of the ingredients into the basin of a slow cooker. Cook on low for about 4-1/2 to 5 hours, or until soft. 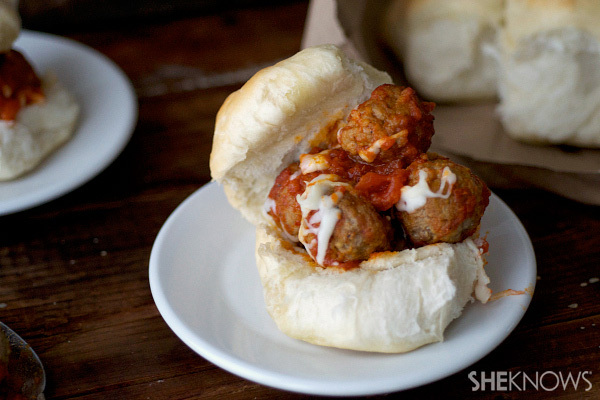 Slice each roll in half and top with 3-4 meatballs and sauce. Add some shredded mozzarella. Grease a slow cooker basin with nonstick cooking spray. Mix the rice, chicken broth, onion, tomatoes, jalapeños, garlic and cumin into the basin of the slow cooker. Add salt and pepper. In a large skillet over medium heat, add ground beef and cook until golden brown, about 5-8 minutes. Drain the grease in a mug and place meat in the slow cooker. Fill each tortilla about 2/3 full and top with 1-1/2 tablespoons Velveeta cheese. Preheat broiler. Broil for about 4-5 minutes, or until cheese is melted and tortillas are browned. Top with fresh cilantro. In a large skillet over medium heat, add the butter. Melt slightly and then add the onions. Cook on medium-low heat for about 20 minutes, or until onions are completely caramelized and a rich caramel color. Drain excess fat on a paper towel. Add the onions, Gruyere, mozzarella cheese, mayo, cream cheese, French onion soup mix and chives to the basin of a slow cooker. Sprinkle with salt and pepper. Cook on low for about 1-1/2 hours, or until melted. Garnish with chives.